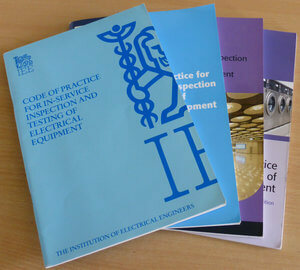 The Code of Practice for In-Service Inspection and Testing of Electrical Equipment was first published in 1994 by the IEE, Institution of Electrical Engineers. By the time the 4th edition was published in 2012, the IEE had a name change to the IET, Institution of Engineering and Technology. We often get asked if it's okay to use an earlier version of the Code of Practice for the City & Guilds course, so I thought it would be useful to look at the changes that have been made to the guidance on PAT testing throughout the 4 editions. The 1st edition includes the standard (0.1 + R)Ω limit, but also has some additional limits: 0.5Ω including the supply cable for BS4533 Luminaires, and (0.5 + R)Ω for BS415 Mains Operated Electronic and Related Apparatus. In the 2nd edition the earth continuity table was dropped and the advice was a (0.1 + R)Ω limit for all equipment. There is no mention of flexing the the cable during the high current test in the earlier editions. The 3rd and 4th editions add the extra requirement that “the resistance measurement should be observed while flexing the cable.” Previously this was only a requirement for the low current tests in 1st and 2nd editions. 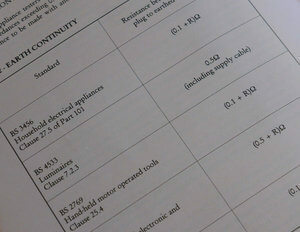 The 3rd edition also introduces the terminology of ‘hard’ and ‘soft’ tests for the high and low current tests. 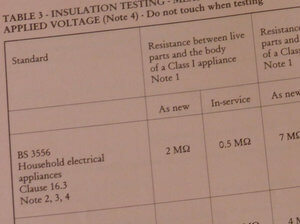 The limits for the insulation resistance test are quite different in the 1st edition than they are in later versions. The 1st edition gives limits for both class 1 and class 2 equipment in both ‘As New’ and ‘In-service’ condition The limit for ‘In-service’ for class 1 is 0.5MΩ, and the limit for ‘In-service’ for class 2 is 1MΩ and a variety of ‘As New’ limits depending on equipment type. In the 2nd edition this has been simplified to just 1.0 MΩ for class 1, 2MΩ for class 2, and 0.3MΩ for class 1 heating & cooking greater than 3kW. A new option of a 250V dc Insulation test voltage for sensitive electronic equipment is introduced in the 3rd edition. The 1st edition briefly mentions that the insulation resistance test may be substituted by an earth leakage measurement where the insulation test is not appropriate. It also gives an example of mineral insulated elements that may not meet the insulation resistance limits, and an earth leakage test could be used instead. There is no mention of the limits for leakage in this section, but Appendix IV on Routine Manufacturing Testing does give some limits: 3.5mA for Class 1 and 0.25 for Class 2. In the 2nd edition a new section on leakage tests has been introduced: 15.6 Protective conductor / touch current measurement. This advises that it is used “as an alternative to the in-service insulation test for use if the insulation resistance test either cannot be carried out or gives suspect test results.” It also includes a table for the leakage limits. The 3rd & 4th editions remain pretty much the same, however it now described as an “alternative or complimentary" test. The substitute leakage test was first introduced in the 3rd edition in section 10.1. The previous versions have no mention of this test. The advice on PAT labels was pretty consistent in the 1st, 2nd, & 3rd editions. “The date on which re-testing is due or the last test date and re-test period should be stated”. This seems like a sensible approach; a user can look at the PAT label and be able to determine if a re-test is due. In the 4th edition there was a complete u-turn on this. The new advice is “The date for re-testing should not be marked on the label”. The 4th edition was introduced after the Professor Löfstedt Report on health and safety legislation recognised that there was an over compliance in PAT testing. This was partially due to PAT contractors often putting annual re-test dates on all labels. The Suggested Initial Frequency of Inspection and Testing of Equipment table remained unchanged in the 1st, 2nd, & 3rd editions. The general advice on the frequency of testing in the 4th edition has been expanded to emphasis the need for a risk assessment approach to determine the re-test frequency. The table on suggested initial intervals is still included, albeit with some minor changes to some of the periods. It also has some new rows for fixed equipment. The 1st edition has a section on Microwave ovens (15.10). This states that microwave leakage (radiation) can occur if the oven is damaged or corroded but microwave leakage tests are normally only carried out after repair. 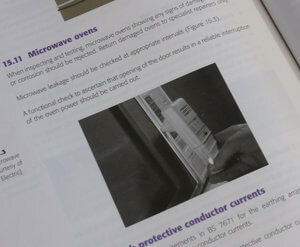 The 2nd edition gives some information on functional checks, but no mention of microwave leakage tests. 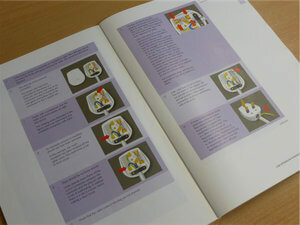 The 3rd edition recommends that “Microwave leakage should be checked at appropriate intervals”. The 4th edition dropped the microwave section completely. The preface gives details that the microwave leakage testing is not within the remit of the CoP as it is not an electrical safety test and for this reason it has been removed. As far as I can see, there is no mention of RCDs in the 1st & 2nd editions. In the 3rd edition it states that “The RCD should be checked for correct operation by plugging it in, switching it on and then pushing the test button.” It also recommends that the trip time is measured. In the 4th edition the wording for the trip time test has been changed and is now a requirement: “timing tests should take place during the combined inspection and testing.” Table 15.5 on RCD operating characteristics has also been updated. From a reader's perspectve, the 3rd edition is a big improvement on the 2 earlier versions. It now includes useful colour diagrams throughout. The colour illustrations in appendix VIII showing examples and information for the visual inspection are a good addition. The 4th edition has a new chapter - 16. This includes some useful information that was missing in previous versions on New Equipment (16.1), Second-hand Equipment (16.2), and Hired Equipment (16.3). If you are buying a copy of the Code of Practice for the City & Guilds PAT course, make sure you get the latest 4th edition; there are still some online retailers selling the old 3rd edition. The current C&G 2377-22 syllabus and exam is based on the 4th edition. 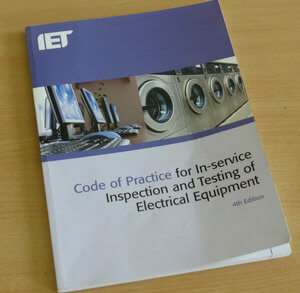 The IET Code of Practice for In-Service Inspection and Testing of Electrical Equipment. 4th edition (ISBN 978-1-84919-626-0) , is available on Amazon here, or on our website here. Second hand copies sometimes come up on Ebay, but just make sure that all the pages are intact, the binding quality on the early print runs of the 4th edition was terrible, so many have missing pages.